2009-01-29 Application filed by Cardiac Pacemakers, Inc. filed Critical Cardiac Pacemakers, Inc.
A wireless electrostimulation system can comprise a wireless energy transmission source, and an implantable cardiovascular wireless electrostimulation node. A receiver circuit comprising an inductive antenna can be configured to capture magnetic energy to generate a tissue electrostimulation. A tissue electrostimulation circuit, coupled to the receiver circuit, can be configured to deliver energy captured by the receiver circuit as a tissue electrostimulation waveform. Delivery of tissue electrostimulation can be initiated by a therapy control unit. This patent application claims the benefit of priority, under 35 U. S. C.
ELECTROSTIMULATION SYSTEM," filed on February 7, 2008 (Attorney Docket No. 00279.F35PRV), incorporated herein by reference in its entirety. This patent application also claims the benefit of priority, under 35 U.S.C. Section 119(e), to Roger Hastings et al., U.S. Provisional Patent Application Serial Number 61/059,993, entitled "WIRELESS TISSUE ELECTROSTIMULATION SYSTEM," filed on June 9, 2008 (Attorney Docket No. 00279. F35PV2), incorporated herein by reference in its entirety. A variety of therapeutically-useful intra-body electrostimulation techniques have been employed by physicians to treat both acute and chronic patient conditions. Electrostimulation of soft muscle tissue may be used, for instance, to elicit contractile behavior, or to inhibit such contractile activation. In particular, electrostimulation is commonly used for cardiac rhythm management. Cardiac rhythm management devices include, for example, pacemakers, cardiac re-synchronization therapy devices, and cardioverter defibrillators. Cardiac rhythm management devices can be used to treat conditions such as atrial or ventricular tachycardia, atrial or ventricular fibrillation, bradycardia, and congestive heart failure. An example of an application of a cardiac rhythm management device includes a battery-operated pulse-generator assembly subcutaneously implanted in the pectoral region, connected to one or more implantable leads deployed through the vasculature using a catheter-based delivery system to locations either within one or more of the heart chambers, or within one of the great veins of the heart. Implantable flexible leads include one or more exposed electrodes to directly stimulate cardiac tissue, or to sense potentials developed across the electrodes by the tissue (e.g., for sensing intrinsic cardiac activity, or sensing the evoked response to the application of electrostimulus). Tissue growth occurs, and frequently surrounds the area of the electrode in contact with tissue. This may result in the beneficial effect of reducing the required electrostimulus threshold to achieve the desired response, but also presents challenges should the necessity arise to re-position or remove the lead. This may preclude the usage of multiple leads in certain locations. Epicardial stimulus locations are also sometimes used, for instance during times when acute pacing therapy is desired, associated with other medical procedures, and where access is easily obtained to the pericardial cavity. OVERVIEW Some conditions, such as congestive heart failure, benefit from pacing at multiple cardiac sites in a specially timed manner, including pacing at a right- ventricular site, and one or more left-ventricular sites. Generally, leads are contra-indicated in the left heart chambers due to the risk of thrombo-embolism. Also, risk exists of mechanical dislodgement, due to the more significant motions, acceleration and impingement of cardiac tissue on the lead and electrode assembly, if a lead system is implanted endocardially in the left ventricle or left atrium. For the reasons above, left-ventricular pacing is typically accomplished from a venous site. However, the risk of obstructing a significant proportion of the venous cross section is great, compromising blood supply to myocardium. It can be difficult to pace at more than one left ventricular site. Additionally, the efficiency of pacing at a venous site can be correspondingly less desirable than an intra-chamber location such as the left-ventricular free wall (e.g., the required pacing energy level to elicit reliable activation or "capture," can be higher at the venous site than at a corresponding endocardial location wherein the electrode is directly implanted in the myocardium). The complexity of lead removal and the limited available area can preclude the usage of multiple leads to achieve multiple stimulation sites in the left heart. Wireless pacing electrodes can eliminate the need for the wired connection between the pulse generator assembly and an electrode assembly at a pacing site, since such wireless assemblies can fit entirely within a heart chamber, at an endocardial location. Generally, pacing energy is supplied to the tissue from a tiny rechargeable battery located in the body of the wireless pacing electrode. Such a design has the advantage of enabling an autonomous pacing assembly, but size considerations can result in frequent (e.g., daily) battery recharge via magnetic induction. Further, the construction of various wireless pacing devices using materials with high magnetic permeability, such as ferrite- core inductors, can present a compatibility problem with magnetic resonance imaging (MRI) equipment. By contrast, among other things, the present system in certain examples can provide electrostimulation at patient implant locations, such as an endocardial location, where usage of lead- wire systems is problematic, and wherein stimulation is desired at multiple sites separate and distinct from the location of a therapy control unit and wireless energy source. The present system in certain examples can also improve useful wireless communication range to, for example, several centimeters in cardiac pacing or other electrostimulation applications, using one or more inductors including a core material having a lower relative magnetic permeability than ferrite, or substantially equal to 1 (e.g., such as air, body tissue, bodily fluids, or one or more other media), or using a tuned receiver design. Multiple receivers can be driven by a single inductive transmit antenna with limited loss in efficiency, as compared to a single receiver. The inductive transmit antenna can be located either subcutaneously within the patient or included with an external device, such as a hospital bed, operating table, hand-held device, hat or clothing, for example. In the case of a subcutaneously-implanted therapy control unit and inductive transmitter (such as a cardiac rhythm management device), explant might be required to replace the battery. Enhanced efficiency from resonant coupling or larger air-core loop inductive antenna structures can facilitate increased operating time between recharge operations or battery replacement. In the case of an external inductive transmitter, a greater distance between the transmitter and wireless electrostimulation node "seed" devices can be achieved. The wireless electrostimulation node "seed" device can be implanted at a cardiac location, such as endocardially, entirely within a heart chamber, and can be configured with an expandable inductive loop antenna. During the implantation procedure, the expandable loop can be initially collapsed or folded to allow easier implant, and then unfolded or expanded to achieve a larger surface area, and hence greater coupling to the inductive transmit antenna. In a cardiac pacing example, an inductive transmit antenna can be incorporated into a cardiac lead system and can be configured to expand or unfold once implanted in a desired location. In an example, a wireless electrostimulation system can include a wireless energy transmission source, and an implantable cardiovascular wireless electrostimulation node. In an example, a receiver circuit can include an inductive antenna, and the antenna can be configured to capture magnetic energy to generate a tissue electrostimulation. In an example, a tissue electrostimulation circuit, coupled to the receiver circuit, can be configured to deliver energy captured by the receiver circuit as a tissue electrostimulation waveform, without requiring a discrete capacitor or electrochemical storage (e.g., a battery, a capacitor using bodily fluid or tissue as an electrolyte, or one or more other storage devices) on-board or conductively coupled to the receiver circuit. In an example, delivery of tissue electrostimulation can be initiated by a therapy control unit. Example 1 comprises a wireless electrostimulation system. In this example, the system includes: a wireless energy transmission source, including an inductive antenna, configured to generate a time- varying magnetic flux; a cardiovascular wireless electrostimulation node sized and shaped to be implantable using a percutaneous transluminal catheter delivery system, the wireless electrostimulation node comprising: a receiver circuit configured to capture at least enough inductively-coupled energy from the inductive antenna to generate a tissue electrostimulation, the receiver circuit comprising a mechanically-expandable inductive pickup configured to link the time-varying magnetic flux, the inductive pickup comprising a core material including a relative magnetic permeability less than 1.1; a tissue electrostimulation circuit, coupled to the receiver circuit, configured to deliver energy captured by the receiver circuit as a specified tissue electrostimulation waveform, the tissue electrostimulation circuit comprising at least one tissue electrostimulation electrode; and a therapy control unit, communicatively coupled to the tissue electrostimulation node and configured to initiate a delivery of a tissue electrostimulation by the tissue electrostimulation electrode. hi Example 2, the system of Example 1 optionally comprises a system wherein the cardiovascular wireless electrostimulation node is configured and sized for intravascular delivery. In Example 3, the system of at least one of Examples 1-2 optionally comprises a system wherein the receiver circuit comprises: an energy storage device configured to store inductively-coupled energy transferred by the time- varying magnetic flux; wherein the energy storage device is configured to store at most 1 milliJoule of energy; and wherein the tissue electrostimulation is inhibited by a depletion of the energy storage device no more than 1 minute after the termination of the inductively-coupled energy transfer. In Example 4, the system of at least one of Examples 1-3 optionally comprises a system wherein the tissue electrostimulation circuit comprises: a rectifier, coupled between the receiver circuit and the tissue stimulation electrode; a direct-current blocking device, coupled between the tissue electrostimulation electrode and the receiver circuit; wherein the at least one tissue electrostimulation electrode comprises a cathode configured to be coupled to cardiac tissue; wherein the at least one tissue electrostimulation electrode comprises an anode configured to be coupled to cardiac tissue; and wherein the tissue electrostimulation circuit is configured to be capable of generating, between the anode and the cathode, an electrostimulation pulse of at least 2.5V peak amplitude at a pulse width of 0.4 msec when coupled to a 500 Ohm equivalent load. hi Example 5, the system of at least one of Examples 1-4 optionally comprises: a mechanically-expandable inductive pickup comprising: an insulated wire loop; an expandable mechanical support comprising a loop of shape- memory material mechanically coupled to the insulated wire loop, wherein at least a portion of the loop of shape-memory material is non-conductive; a housing comprising: a receiver circuit electrical charge storage device conductively coupled to the insulated wire loop; the tissue electrostimulation circuit; wherein the housing is disposed within a space encompassed by the loop of shape-memory material; and a strut, comprised of shape-memory material, configured to secure the loop of shape-memory material to the cylindrical housing. hi Example 6, the system of at least one of Examples 1-5 optionally comprises a bio-compatible dielectric encapsulant configured to encompass at least a portion of the inductive pickup. hi Example 7, the system of at least one of Examples 1-6 optionally comprises a system wherein the wireless energy transmission source is configured to vary a burst pulse duration of the time- varying magnetic flux, wherein the tissue electrostimulation circuit comprises a voltage clamping device coupled to the output of the rectifier, and wherein the energy content of the electrostimulation pulse is controlled by the burst pulse duration when a voltage across the voltage clamping device is substantially equal to or greater than a voltage clamping device threshold voltage. hi Example 8, the system of at least one of Examples 1-7 optionally comprises a system wherein the inductive pickup is configured for a maximum outside diameter, when expanded, of less than or equal to 2 cm; wherein the housing comprises a cylindrical diameter less than or equal to 2 mm, and a length less than or equal to 5 mm; and wherein a total length of the cylindrical housing and the cardiac tissue attachment mechanism is less than or equal to a nominal minimum myocardial tissue wall thickness of 10mm. In Example 9, the system of at least one of Examples 1-8 optionally comprises a system wherein the wireless energy transmission source is configured to generate the time- varying magnetic flux at a specified receiver resonant frequency within a range of frequencies from 500 kilohertz to 5 megahertz, inclusive; and wherein the wireless energy transmission source is configured to deliver the inductively coupled energy at a power coupling efficiency of at least 1%. In Example 10, the system of at least one of Examples 1-9 optionally comprises a system wherein the wireless energy transmission source and the therapy control unit are both configured to be located external to a patient's body containing the wireless electrostimulation node. In Example 11, the system of at least one of Examples 1-10 optionally comprises a battery-powered implantable cardiac rhythm management unit that includes the wireless energy transmission source and the therapy control unit. In Example 12, the system of at least one of Examples 1-11 optionally comprises a system wherein the wireless energy transmission source comprises: an implantable flexible lead comprising: a distal end configured to be located near the implantable wireless electrostimulation node; a proximal end configured to be located at or near a housing of the battery-powered implantable cardiac rhythm management unit; at least two antenna feed conductors disposed internally to the lead and conductively coupled to the housing of the battery- powered implantable cardiac rhythm management unit; the inductive antenna disposed at the distal end of the lead, and conductively coupled to the at least two antenna feed conductors at the distal end of the lead; and the therapy control unit configured to energize the at least two antenna feed conductors. Example 13 describes a method. In this example, the method comprises: delivering a cardiovascular wireless electrostimulation node to an intra-body location; expanding a wireless electrostimulation node inductive pickup; generating a time- varying magnetic flux; linking the time- varying magnetic flux to the wireless electrostimulation node inductive pickup; configuring a wireless electrostimulation node inductive pickup wire loop with a core material of a relative magnetic permeability less than 1.1; capturing at least enough inductively-coupled energy to deliver a tissue electrostimulation; controlling the initiation of the delivery of a specified tissue electrostimulation waveform; and delivering a specified tissue electrostimulation waveform in response to an initiation. In Example 14, the method of Example 13 optionally comprises delivering a cardiovascular wireless electrostimulation node through a vascular path to an intra-body location. In Example 15, the method of at least one of Examples 13-14 optionally comprises: storing the inductively-coupled energy within an energy storage device included in the wireless electrostimulation node; inhibiting the storage of more than 1 milli Joule of energy within the energy storage device; terminating the time- varying magnetic flux; depleting the energy storage device; and inhibiting the delivery of the tissue electrostimulation more than 1 minute after the termination of the time-varying magnetic flux in response to the depleting the energy storage device. In Example 16, the method of at least one of Examples 13-15 optionally comprises: rectifying the time-varying magnetic flux; coupling a cathode to cardiac tissue; coupling an anode to cardiac tissue; generating, between the anode and the cathode, an electrostimulation pulse of at least 2.5 V peak amplitude at a pulse width of 0.4 msec when coupled to a 500 Ohm equivalent load; and blocking the passage of direct-current between a tissue stimulation electrode and a receiver circuit. 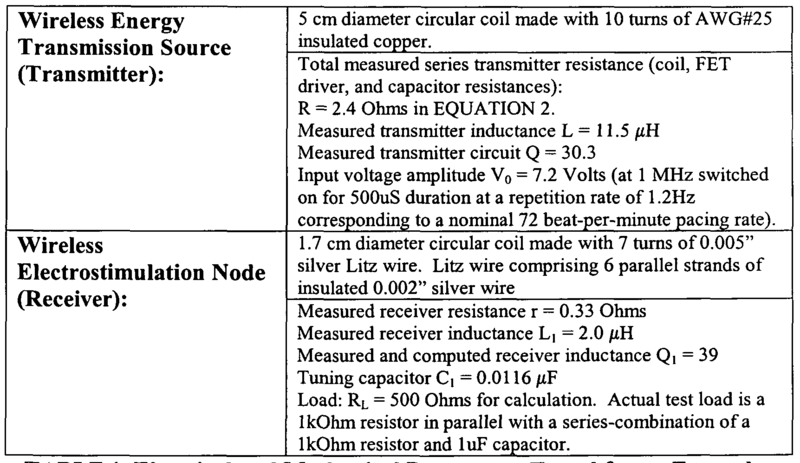 In Example 17, the method of at least one of Examples 13-16 optionally comprises: insulating the inductive pickup wire loop; coupling the inductive pickup wire loop to a shape-memory mechanical support mechanically; expanding the shape-memory expandable mechanical support to a specified loop shape proximate to a cardiac tissue wall; forming a non-conductive portion along the circumference of the shape-memory expandable mechanical support; coupling the shape-memory mechanical support to a cylindrical housing mechanically; and disposing the cylindrical housing within a space encompassed by the shape-memory mechanical support.. In Example 18, the method of at least one of Examples 13-17 optionally comprises: encompassing at least a portion of the inductive pickup with a biocompatible dielectric encapsulant. hi Example 19, the method of at least one of Examples 13-18 optionally comprises: varying a burst pulse duration of the time-varying magnetic flux; clamping a voltage developed by the rectifying the time- varying magnetic flux; and controlling the energy content of the electrostimulation pulse, via the varying of the burst pulse duration of the time-varying magnetic flux, when a voltage across a voltage clamping device is substantially equal to or greater than a voltage clamping device threshold voltage. In Example 20, the method of at least one of Examples 13-19 optionally comprises: expanding the inductive pickup to a maximum outside diameter, when expanded, of less than or equal to 2 cm; limiting the cylindrical housing to a diameter less than or equal to 2mm; limiting the cylindrical housing to a length less than or equal to 5mm; and limiting a total length of the cylindrical housing and a cardiac tissue attachment mechanism to less than or equal to a nominal minimum myocardial tissue wall thickness of 10mm. In Example 21, the method of at least one of Examples 13-20 optionally comprises: generating the time-varying magnetic flux at a specified receiver resonant frequency within a range of frequencies from 500 kilohertz to 5 megahertz, inclusive; and transferring the inductively-coupled energy at a power coupling efficiency of at least 1%. hi Example 22, the method of at least one of Examples 13-21 optionally comprises: generating the time- varying magnetic flux from a location external to a patient's body; and initiating a tissue electrostimulation from a location external to the patient's body. In Example 23, the method of at least one of Examples 13-22 optionally comprises: delivering a battery-powered implantable cardiac rhythm management unit to an intra-body location; conductively coupling an inductive antenna to the implantable cardiac rhythm management device; generating the time-varying magnetic flux using the inductive antenna; and initiating a tissue electrostimulation using the implantable cardiac rhythm management unit. In Example 24, the method of at least one of Examples 13-23 optionally comprises: locating a distal end of an implantable flexible lead near to the implantable wireless electrostimulation node; mechanically coupling the inductive antenna to the distal end of the implantable flexible lead; locating a proximal end of the cardiovascular implantable flexible lead at or near to a housing of the battery-powered implantable cardiac rhythm management unit therapy control unit; locating at least two antenna feed conductors within the implantable flexible lead; conductively coupling the at least two antenna feed conductors from the battery-powered implantable cardiac rhythm management unit therapy control unit housing to the inductive antenna; and energizing the at least two antenna feed conductors. Example 25 describes a system. In this example, the system comprises: means for delivering a cardiovascular wireless electrostimulation node to an intra-body location; means for expanding a wireless electrostimulation node inductive pickup; means for generating a time-varying magnetic flux; means for linking the time-varying magnetic flux to the wireless electrostimulation node inductive pickup; means for surrounding a wireless electrostimulation node inductive pickup wire loop with a material of a relative magnetic permeability less than 1.1 ; means for capturing at least enough inductively-coupled energy to deliver a tissue electrostimulation; means for controlling the initiation of the delivery of a specified tissue electrostimulation waveform; and means for delivering a specified tissue electrostimulation waveform in response to an initiation. FIG. l is a diagram illustrating generally an example of at least a portion of a wireless electrostimulation system including a wireless energy transmission source, an implantable flexible lead comprising an inductive antenna, and multiple wireless electrostimulation nodes configured at cardiac sites. FIG. 2 is a schematic diagram illustrating generally an example of at least a portion of a wireless electrostimulation system including a wireless energy transmission source and a wireless electrostimulation node. FIGS. 3 A-B are views illustrating generally at least a portion of an example of a wireless electrostimulation node included in a wireless electrostimulation system. FIGS. 4A-B are similar to FIGS. 3A-B, but illustrate generally at least a portion of another example of a wireless electrostimulation node included in a wireless electrostimulation system. FIG. 5 is a partial cross-sectional view illustrating generally an example of at least a portion of a wireless electrostimulation system including a delivery catheter containing a wireless electrostimulation node. FIG. 6 is a partial cross-sectional view, similar to FIG. 5, but illustrating generally an example of at least a portion of a wireless electrostimulation system including the removal of a pull wire and the retraction of an actuator and delivery catheter. FIG. 7 is a partial cross-sectional view illustrating generally an example of at least a portion of a wireless electrostimulation system including a wire loop and a mechanical support, showing a local encapsulant surrounding the wire loop and a bulk encapsulant surrounding both the mechanical support and wire loop. FIG. 8 is a diagram illustrating generally a perspective view of an example of at least a portion of a wireless electrostimulation system including a spiral wire loop wound coaxially to encircle a mechanical support. FIG. 9 is a diagram, similar to FIG. 8, but illustrating generally an example of a perspective view of at least a portion of a wireless electrostimulation system including wire loop wound in a spiral on one face of a mechanical support. FIG. 10 is a diagram, similar to FIG. 1, but illustrating generally an example of at least a portion of a wireless electrostimulation system including an external device generating a time- varying magnetic flux. FIG. 11 is a diagram illustrating generally an example of at least a portion of a process including a wireless stimulation node. FIG. 12 is an example of a plot showing an analysis of the predicted output voltage developed at an example of a wireless electrostimulation node inductive pickup receiver, and the corresponding actual output voltage when measured on a laboratory model, both plotted versus the separation between an energy transmission source inductive antenna transmitter and wireless electrostimulation node inductive pickup receiver. FIG. 13 is an example of a plot from an efficiency analysis showing the computed power coupling efficiency and battery lifetime associated with a given separation between an example of an energy transmission source inductive antenna transmitter and an example of a wireless electrostimulation node inductive pickup receiver. FIG. 14 is a diagram, similar to FIG. 1, but illustrating generally an example of at least a portion of a wireless electrostimulation system including a subcutaneous inductive antenna. FIG. l is a diagram illustrating generally an example of at least a portion of a wireless electrostimulation system 100 including a subcutaneous implantable cardiac rhythm management unit 120, and an implantable flexible lead 106 coupled to an inductive antenna 108, and multiple implantable wireless electrostimulation nodes 11 OA, HOB. FIGS. 3A-B, 4A-B can be referred to for more detailed views of examples of wireless electrostimulation nodes HOA, HOB. The implantable wireless electrostimulation nodes, HOA, HOB, can be implanted entirely within the heart, for example, at an endocardial site along the left ventricular free wall 102 A and penetrating the myocardium 102E. In the example of FIG. 1, the combination of the cardiac rhythm management unit 120, flexible lead 106, and inductive antenna 108 can be configured as a wireless energy transmission source. The wireless electrostimulation nodes or "seeds," HOA, HOB, can be configured to receive inductively-coupled electromagnetic energy 114 as a time- varying flux generated by the inductive antenna 108. The energy 114 is captured by expandable inductive pickups 112 A, 112B coupled to each seed 11 OA, HOB. In the example shown in FIG. 1, the inductive antenna 108 can be disposed at the distal end of the implantable flexible lead 106 such as to transmit energy 114 across the ventricular septal region 102B, with the antenna 108 located near a fixation device 107. The fixation device 107 can be located at or near the apical region 102C of the right ventricle. 102C, 102D, such as by using one or more tissue attachment or fixation devices 105, 107 respectively comprising one or more conductive electrodes. The electrodes can be conductively supplied with electrostimulation energy, such as through one or more wires located internally to one or more of leads 104, 106. In certain examples, one or more additional wireless stimulation nodes, such as HOA, HOB can be located in one or more other left heart 102 regions, such as the left atrium or left ventricular septal region. Such locations within or associated with the left heart 102 can be used, for example, in delivery of electrostimulation such as for cardiac resynchronization therapy, or to achieve conversion of atrial or ventricular tachyarrhythmias through electrostimulation. In examples involving one or more left-atrially associated seeds, similar to HOA, HOB, a right-atrial flexible implantable lead 104, and fixation device 105 can incorporate an inductive antenna 108, such as located in the atrial septal region, or one or more other atrial regions, such as 102D. In other examples, one or more other subcutaneous or external locations can accommodate the wireless energy transmission source and inductive antenna 108, including, for example, the vena cava, pericardial space, or esophageal space. FIG. 10 shows an example of an external wireless energy transmission source 1040. In certain examples, control of initiation, timing, or delivery of electrostimulation is provided by the CRM device 120 comprising one or more sensing electrodes 122A, 122B disposed on the housing 126B or header 126A of the CRM device 120. The sensing electrodes 122 A, 122B can, among other things, provide electrogram sensing of intrinsic cardiac activity, evoked response to electrostimulation, or parameters related to patient activity level (e.g., respiration, heart rate). Additionally, in another example, one or more fixation devices 105, 107 can provide one or more sensing electrodes, and conductively couple one or more sensed signals via leads 104, 106 to the CRM device 120. In some examples, delivery of multiple seeds can allow defibrillation or cardioversion to be achieved using electrostimulation by the seeds, while decreasing, minimizing, or eliminating pain or patient discomfort. To achieve effective cardioversion or defibrillation, multiple re-entrancy paths within the cardiac tissue can be broken, or de-sensitized. The total delivered energy used to de-sensitize (e.g., inhibit activation of) enough myocardium, 102E, for instance, can be substantially larger if only a single defibrillation vector is used (e.g., a single pair of electrodes), compared to using multiple defibrillation sites. FIG. 2 is a schematic diagram illustrating generally an example of at least a portion of a wireless electrostimulation system 200 including a wireless energy transmission source 220 and a wireless electrostimulation node (seed) 210. The example in FIG. 2 shows a wireless energy source 220 that can include a battery 226, voltage regulator 225, and a microprocessor 224. In certain examples, the microprocessor 224 comprises input-output (I/O) capability such that a switching structure 228 can be coupled to the microprocessor 224 to control current flow from the battery 226 or an optional transient energy storage device such as a capacitor 227 to an inductive antenna 206. In one example, the inductive antenna is comprised of a wire loop 208. In another example, the inductive antenna 206 comprises of multiple wire loops 208 that can be configured spatially orthogonal to one another such as to reduce orientation sensitivity. A tuning element 229 can be used to allow a range of frequencies to be selected at which a time- varying magnetic flux 214 will be generated by the inductive antenna 206. The resulting inductance-capacitance (LC) circuit forms a resonant "tank" circuit, which can have an operable range of resonant frequencies selected from a range of 300 KHz to 10 MHz, but selected below the self-resonant frequency of the inductor 208 comprising the inductive antenna 206. Some examples of the tuning element 229 can include, but are not restricted to, a capacitor, a variable-capacitance diode ("varicap" diode), an active circuit modeling a capacitor of a selected value, etc. In some examples, the switch 228 and tuning element 229 can be replaced, such as by a combination of a voltage-controlled oscillator and power amplifier coupled to directly drive the inductive antenna 206 such as to achieve generation of magnetic flux 214 at a specified range of frequencies. The switch 228 can be realized either mechanically as a microminiature relay device, or as solid-state device (e.g., FET, BJT, IGBT, SCR, or other thyristor). In some examples, the regulator 225, microprocessor 224, sensing circuit 223, and switching device 228 are co-integrated in a single integrated circuit or multi-chip module package. Note that the term "microprocessor" can also include, among other things, a microcontroller device including one or more of volatile or non- volatile memory, multiple input/output channels, analog-to-digital conversion devices, power supplies, or digital-to-analog conversion devices that can be co-integrated in, for example, a single integrated circuit, single circuit package, multi-chip module package, hybrid, polyimide flex-circuit assembly, etc. In some examples, the initiation, timing, duration and frequency range of the generation of magnetic flux 214 is controlled by the microprocessor 224 wherein the microprocessor 224 is provided with input from a sensing circuit 223. The sensing circuit 223 can be coupled to, for example, wire leads 204A, 204B implanted subcutaneously within cardiac tissue 202A. In another example, the wireless energy transmission source can be external to the body, and leads 204A, 204B can be coupled to the skin of the patient (e.g., to measure electrocardiograms). In the example shown in FIG. 1, the transmission source 220 can comprise one or more sense electrodes 222A, 222B coupled to the sensing circuit. In one example, sense electrodes 222A, 222B are disposed on the housing of wireless energy transmission source 220. The time-varying magnetic flux 214 may be generated for either transferring operating energy 214A to the seed device 210, or for communication 214B with the seed device 210 (e.g., one range of frequencies can be established for wireless energy transfer, and a second range of frequencies can be established for commanding the seed device 210 to deliver stimulus). In the example shown in FIG. 2 filter 209 can discriminate between power 214A and communication 214B signaling. For example, filter 209 can be configured to detect a particular range of frequencies of time- varying flux 214B captured by the seed 210 such as by using an inductive pickup 212. The filter 209 can be coupled to stimulus control logic 216. Logic 216 can be configured to either inhibit or to initiate tissue electrostimulation, such as in response to the filter 209 detecting a specified signal. Filter 209 can include, in certain examples, a band-pass filter, which can be coupled to a threshold comparator. In certain examples, the filter 209 can include a digital demodulator. In some examples, communication signal 214B can be encoded digitally and transmitted concurrently to, or comprising, power signal 214A. Examples of digital encoding of communication signal 214B can include, but are not restricted to, on-off keying, amplitude-shift keying, phase-shift keying, frequency-shift keying, or the like. In some examples, the combination of the capacitance of the tuning element 229 and actual or parasitic capacitances of the inductive antenna 206 can vary when the wireless energy transmission source is implanted in or near tissue 202E. The effect of tissue interaction with the system can be reduced by at least partially surrounding the inductive antenna 206 or inductive pickup 212 (see, e.g., FIG. 7) with a protective material or encapsulant. Such encapsulation can inhibit or prevent tissue 202E or liquid penetrating into the cavities between individual turns of a multi-turn inductive pickup 212 or inductive antenna 206, which would otherwise increase the effective relative dielectric constant seen by the pickup 212, or antenna 206. In some examples, the microprocessor 224 can be configured to adjust the capacitance of the tuning element 229, or to adjust the frequency of a corresponding voltage-controlled oscillator, such as to achieve a desired level of efficiency in coupling to the implanted seed 210. In an example, cardiac pacing electrostimulus can be applied using electrodes 250 and 260, and the evoked response can be observed using either sensing electrodes 205A, 205B, 222A, 222B or an external electrocardiogram sensing apparatus. Tuning element 229, or a corresponding frequency synthesizer, can be adjusted by microprocessor 224, such as to vary the range of frequencies of magnetic flux 214 that are generated, for example, until a desired or reliable "capture," (e.g., activation of cardiac tissue resulting from electrostimulation) is observed. The seed device 210 can include an inductive pickup 212 and an optional discrete tuning element 211. In an example, the value of the capacitance of element 211 can be selected before implant of the seed device, such as to achieve a desired resonant frequency when implanted, such as surrounded by blood or muscle tissue. In some examples, to reduce the size of the seed device 210, a discrete capacitor 211 can be omitted, and the capacitance used to achieve resonance of the inductive pickup 212 can be the parasitic capacitance of the physical coil structure of the inductive pickup 212 (for example, the inter- winding capacitance). Inductively-coupled energy 214A can be rectified, such as by a full-wave rectifier 213, as shown in the example in FIG. 2, or by a half-wave rectifier, which can save space by reducing the number of diode components used in the seed device 210. Rectified energy can be stored in an optional energy storage device 215, such as shown in the example in FIG. 2. In an example, the energy storage device 215 can act like a filter capacitor, such as to help suppress ripple voltage. Stimulus control logic 216 can be coupled to a switch device 217. The switch 217 can include a solid-state device (e.g., FET, BJT, IGBT, SCR, thyristor, etc.). In an example, such as to reduce the size of the seed 210, the filter 209, logic 216, switch 217, and rectifier 213 can be co-integrated into a single integrated circuit package, or for example, into a multi-chip module, etc. similar to that described above in the context of the wireless energy source 220. In some examples, multiple storage devices 215 and switches 217 can be used, such as to arrange stored voltages in a desired series, parallel, or series- parallel combination, such as to achieve an electrostimulus peak voltage in excess of the maximum voltage stored on a single storage device 215 using the power signal 214 A. A direct-current (DC) blocking device 218 can be used to inhibit a DC- stimulus component from being coupled to electrostimulus electrodes 250, 260. Electrostimulus electrodes 250, 260 can be conductively coupled to the muscle tissue 202E to be electrostimulated (e.g., myocardial tissue). In an example, electrode 250 can be used as the cathode electrostimulation electrode, and electrode 260 can be used as the anode electrostimulation electrode. The blocking device 218 and the shunt device 219 can form a high-pass network configured such that the upper cutoff frequency and resulting time- domain pulse shape can be selected or even programmably adjusted such as to form a desired electrostimulus waveform. In an illustrative example, blocking device 218 can be selected as a capacitor having capacitance of about 1 microFarad, and shunt device 219 can be selected as an approximately 5 kiloOhm resistor to achieve a desired cardiac tissue electrostimulation pacing pulse. The present inventor has recognized that, among other things, tissue and body fluid inductive energy absorption and dispersive effects can rapidly increase at frequencies greater than 100 KHz. These effects can severely limit the range and maximum achievable efficiency of typical magnetic coupling schemes. One technique for decreasing the losses induced by such effects can be to substantially or completely surround the inductors 208, 212 with a high relative permeability magnetic material such as an iron-powder core or a ferrite material or the like. Such materials can magnify the magnetic flux density seen by wound structures nearby them, at a given incident magnetic field intensity. The high relative magnetic permeability of such materials can render the resultant implantable device assemblies incompatible with magnetic resonance imaging (MRI) equipment. Forces or torques induced locally (e.g., induced in single components) associated with the strong bias field present near operating MRI equipment could result in mechanical damage to the inductive antenna 206 or inductive pickup 212 assemblies if they incorporate a high relative magnetic permeability material. Additionally, operating MRI equipment can induce large voltages across the terminals of the inductive antenna 206 or inductive pickup 212, and large currents inducing an internal temperature rise. These effects can result in irreversible damage (e.g., electrical short-circuiting or dielectric failure) to the inductors 208, 212 or to other components electrically coupled to the inductors 208, 212, and possibly thermal damage to surrounding tissue 202E. Additional protection devices (e.g., discharge tubes, gaps, solid-state transient-suppression devices) can be included to inhibit or prevent MRI-related electrical damage. In the case of the seed device 210, small size is generally desired (e.g., to allow intravascular introduction and placement) and such additional protection devices can take up additional space and could fail to mitigate the MRI-induced forces and torques. The present inventor has also recognized, among other things, that ferrite core materials can also have limitations. For example, internal loss mechanisms can preclude their usage as core materials for highly-tuned inductors at frequencies in excess of a few MHz. This prevents the resonant "tank circuits" in the inductive transmit network, 229, 208 and inductive receiver network 212, 211, from achieving high power coupling efficiencies, since the Quality factors ("Q") of both networks are limited by the resistive damping effects of increasing losses within the ferrite core material. By contrast, the present inventor has recognized that, in a different approach, the core materials or mechanical supports surrounding the inductive antenna 206 or inductive pickup 212 can be selected to have a relative magnetic permeability less than 1.1, and can be comprised of one or more materials other than ferrites, or the core material or mechanical support can provide the antenna 206 or the pickup 212 with an effective relative magnetic permeability substantially equal to 1 (such as by using a non-magnetic material, such as air, blood, bodily tissue, bodily fluid, or one or more other materials for the core material or the mechanical supports). Materials, such as shape-memory Nickel-Titanium (NiTi or Nitinol) compounds, are effectively non-ferromagnetic and can have other beneficial mechanical properties. For example, the shape-memory property can be used to expand (e.g., after implant) a loop antenna 206 or inductive pickup 212. By increasing or maximizing the area of a loop forming an inductive antenna 206, or inductive pickup 212, the mutual coupling of two such inductive devices in proximity can be enhanced. Such materials can also help mitigate ferrite efficiency loss and allow more efficient coupling of time- varying magnetic flux through tissue, such as at frequencies up to several MHz. The term "air core" can be used to describe the inductive transmitter 208 and receiver 212 structures, even though the actual construction of such devices might include non- ferromagnetic metallic support structures and, when implanted, tissue or bodily fluid may be present within the core of the inductive transmitter 208 or receiver 212. A mathematical analysis of a simplified combination of the wireless energy source 220 and seed 210 allows power coupling efficiency, η, and electrostimulus output voltage magnitude, |VL|, to be computed. The combination of switch 228, and battery 226 can be represented as an AC voltage source operating at angular frequency ω, and peak output voltage Vo. The inductive antenna 206 can be modeled as a combination of an ideal inductor 208, as L, in series with a transmit circuit resistance R. Tuning element 229 can be modeled as a capacitor, C. The transmit circuit impedance can be represented as Z = R + i ( ωL - 1/ωC J, in which i = yfl . At resonance, C = l/ω2L, and Z = R. The imaginary components, due to the reactances of the capacitor and inductor, can cancel each other (unity power factor). Similarly, for the circuitry included in seed 210, the inductor 212 can be modeled as Li, and its corresponding loss as resistance "r" in series with Li. Tuning element 211 can be modeled as a parallel capacitor Ci, and the tissue load 202E appearing across electrostimulus electrodes 250, 260 can be modeled as RL- Neglecting the rectifier 213, switch 217, shunt capacitor 215, blocking device 218, and shunt resistor 219, the receiver inductive pickup impedance can be represented as Zi = r + iωL\ and the impedance associated with the tissue load and tuning element can be represented as ZL = RL / ( 1 + ^RLCI ). For the seed 210, this corresponds to a lossy inductive pickup Zi = r + /ωLi in parallel with a load comprised of ZL = RL / ( 1 + I'WRLCI ). The total parallel impedance Z2 = r + RL / ( 1 + (ωRLCi)2 ) + / [ωLi - ωRL 2 Ci / / ( 1 + (ωRLCi)2 ]. At resonance, 1 + (ωRLCi)2 = RL 2Ci / Li, and Z2 = r + RL / ( 1 + (ωRLCi)2 ) = r[ 1 + Li/(rRLCi) ]. The magnitude of ZL= >/(Li/Ci) . KQQI » 1 + X, V → x / ( 1 + x ) (3) and when x»l, the power coupling efficiency, η, approaches 1 (corresponding to 100%). Thus, for small values of the coupling constant, K, if the quality factors are sufficiently large, the power coupling efficiency can approach unity. Generally, the seed 210 receiver resonant frequency and quality factor Qi can vary depending on the specific implant configuration of the inductive pickup 212, and the resulting tissue and blood proximity effects on the electrical response of the inductive pickup 212. However, by actively statically or dynamically varying the value of tuning element 229 in the wireless energy source 220, as described previously, the wireless energy source 220 transmitter resonant frequency can be varied, such as to compensate for changes in the seed 210 receiver resonant frequency or to control electrostimulus amplitude or energy achieved at electrodes 250, 260. If the transmitter 220 quality factor, Q, is selected to be much greater than the receiver quality factor, Qi, the receiver can have a broader "tuning envelope" than the transmitter. With a broader seed 210 receiver response characteristic, the transmitter tuning element 229 can be adjusted more easily (e.g., less precisely) to provide an operating frequency at resonance corresponding the to resonant frequency of the receiver in seed 210 (e.g., the transmitter can be tuned to be more sharply "peaked" at resonance than the receiver, and transmitter resonant frequency can then be swept until centered on receiver resonant frequency). In some examples, varying the resonant frequency of the transmitter by changing the capacitance of tuning element 229 can also control the magnitude of the electrostimulus voltage coupled to the tissue load 202E. Selecting a value for tuning element 229 that shifts the resonant frequency of the wireless energy source 220 away from the resonant frequency of the seed 210 can result in decreasing maximum voltage, |VL|, coupled to the tissue load 202E. This can reduce the size of the seed 210 by eliminating or reducing the complexity of logic 216 and the switch device 217 such as by allowing electrostimulation amplitude control to be accomplished by the wireless transmission source 220. In some examples, power signal 214A can be limited in duration or maximum amplitude such as to avoid tissue heating or regulatory limits for average or instantaneous power transmitted through tissue. The resulting rectified energy can be integrated or otherwise accumulated by, for example, storage device 215. |VL| can, for instance, be established by a series- or shunt- regulation component such as a Zener diode 230. In some examples, Zener diode 230 can be used to simplify or eliminate stimulus control logic 216 and switch device 217 when a pulse- width modulation (PWM) scheme is used at the transmission source 220. A microprocessor, state machine, timing logic, and the like can be omitted from the seed 210 to reduce complexity, physical volume, etc. In one example, stimulus control logic 216 can still be used to inhibit electrostimulation delivery to tissue load 202E (e.g., by opening switch device 217 when an intrinsic event is sensed), but is not required to control the level of electrostimulation energy content delivered to tissue load 202E. In some examples, power signal 214A can be established at a specific burst duration (e.g., a burst can be a square pulse envelope commencing a sequence of multiple resonant oscillations). The duration or pulse width of the burst of power signal 214 A can be related to the energy content delivered to the tissue load 202E when the regulation device 230 is clamping the voltage across the storage device 215. If tissue 202E is modeled as a cardiac tissue load having a resistance RL = 1 kiloOhm in parallel with a series-combination of a 1 kiloOhm resistor (ΓL) and a 1 microFarad capacitor (CL), a cardiac tissue electrostimulation pacing pulse of greater than 4V peak amplitude, |VL|, can be achieved using a resonant frequency of 1 MHz. For the leading edge of an example of a cardiac tissue electrostimulation pulse, the load capacitor can be represented effectively as a short circuit, and the AC resistance of the model cardiac tissue load 202E is equal to around 500 ohms (1 kiloOhm in parallel with 1 kiloOhm). In some examples, the burst duration of power signal 214 A can be controlled by the microprocessor 224 and switching element 228 at the transmission source 220 to achieve a desired energy content coupled to the tissue load 202E. In an example, VCLAMP can be 5.6V (e.g., established by a Zener diode 230), w can be 775 microseconds, ΓL = R = 1 kiloOhm, and C = I microFarad. Using EQUATION 4, VCAP can be computed as approximately 3 Volts. In another example, w can be 1250 microseconds, and VCAP can be computed as approximately 4 Volts. hi some examples, the volume occupied by seed 210 can be decreased by limiting the total energy stored, for example, storage device 215. An estimate of the desired stored energy for various electrostimulation pulses can be made. For example, if RL = 500 Ohms, and |VL| = 2.5V, a square-wave pulse of duration T = 0.4 milliseconds can correspond to a stored electromstimulation energy of T|VL|2 / RL = 5 microJoules. Storage device 215 can be specified as a capacitor = Cs, in microFarads. The energy stored in capacitor 215 can be represented as 1A CS|VL|2. The number of electrostimulation delivery cycles that the energy stored in the capacitor 215 can deliver can be represented as: the energy stored on the capacitor = 1Z2 CS|VL|2, divided by the electrostimulation energy consumed by a single electrostimulation cycle delivered to the tissue impedance = T|VL|2 / RL- Thus, the number of cycles that capacitor 215 can supply can be represented as = RLCS/2T. Tradeoffs can be made between storage device 215 value Cs, load resistance RL and, for example, pulse width, to achieve a desired seed 210 volume and a desired electrostimulation duration, for instance, during an interval when inductive power signal 214A can be inhibited. For example, the number of desired electrostimulation cycles can be = N, and the capacitor value for storage device 215 to provide N electrostimulation cycles can be represented as Cs = 2TN/RL. In an example, an electrostimulation pulse duration can be specified as T = 0.4 msec, the load resistance can be RL = 500 Ohms, and the capacitance Cs can be represented for N=I as Cs = 1.6 μF. A low voltage 1.6 μF capacitor 215 can be small (e.g., sub-millimeter dimensions on each axis). In some examples, back-up storage can be desired for patient protection (e.g., to provide continued electrostimulation for a limited duration in the temporary absence of power signal 214A). A heart rate can be specified = HR in Hertz, a number of cardiac cycle to be paced in a total time = Tstored, in seconds, can be represented = HRTstored, and the size of the capacitor to store a corresponding amount of energy can be represented, Cs = 2THRTstOred/RL- For example, one hour = 3600 sec of stored electrostimulation energy and a heart rate of 72 beats per minute or 1.2 Hz can be specified, resulting in, for example, a number of pacing electrostimulation cycles HRTstOred = 4320, and a total stored energy = 21.6 milliJoules. The tissue impedance RL can be specified as 500 Ohms and pulse width can be specified as T = 0.4 msec, and the capacitance 215 can be represented Cs = 6912 μF. Such a capacitor can occupy several cubic millimeters of volume in the receiver circuit. In some examples, a compromise between capacitor 215 value Cs and the physical size of the capacitor 215 can be made. For example, a capacitor 215 can be specified, Cs = 320 μF, and electrostimulation pulses can be specified, |VL| = 2.5 volts. In an example, the total energy stored on capacitor 215 is 1 milliJoule, and can be enough energy to deliver 200 electrostimulation cycles of pulse width T = 0.4 msec to into a tissue load RL =500 Ohms. In an example, capacitor 215 can be specified Cs = 320 μF and the electrostimulation cycle rate of 72 electrostimulation cycles per minute can result in continued electrostimulation delivery, for approximately 2.8 minutes, by seed 210, after energy 214 A input to Cs is inhibited. Capacitor 215 can also be specified to accommodate the quiescent power consumed by, for example, stimulus control logic 216 comprising a microprocessor, which can be very small depending upon the device used, but in some cases can be comparable to, or larger than, the average pacing power, hi some examples, the power consumed by the receiver circuit 210 can be reduced if stimulus control logic 216 and filter 209 are omitted and switch 217 is permanently closed or omitted. For some examples, the capacitor Cs can be a filter capacitor, and the energy 214A received by the seed 210 is rectified and delivered directly to the tissue load (e.g., the delivered electrostimulation pulse width can correspond to the width of a transmitted energy 214A burst pulse, provided that the time constant T = CSRL is less than about one half of the pulse width). In some examples, direct conversion of energy 214A into an electrostimulation delivery can be achieved and Cs < 0.4 μF can be specified (e.g., corresponding to an electrostimulation pulse width of T = 0.4 msec and load RL = 500 Ohms). In some examples, sensing circuitry 232 can be coupled to cardiac tissue 202E to provide signaling to stimulus control logic 216 in response to sensed potentials detected by the sensing circuitry 232. Signaling to stimulus control logic 216 can occur in response to intrinsic tissue activity (e.g., sensing circuitry 232 establishes a threshold level or window and intrinsic activity can cause a voltage fluctuation exceeding a threshold level or window). Stimulus control logic 216 can inhibit electrostimulation using switch 217 in response to, for example, detection of sensed events provided by sensing circuitry 232. hi some examples, a shunt device 219 can also provide charge neutralization. Charge neutralization can include providing a path between the electrostimulus electrodes 250, 260 to slowly discharge an afterpotential occurring during or after an electrostimulation, resulting in a net neutral charge delivered by the electrostimulation electrodes 250, 260. For the example of a pacing waveform described above, charge neutralization can be observed as a smaller amplitude negative-phase pulse of longer duration following the positive-phase cardiac tissue electrostimulation pulse. FIGS. 3 A-B are views illustrating generally at least a portion of an example of a wireless electrostimulation node HOA or "seed" that can be included in a wireless electrostimulation system. Wireless electrostimulation node HOA can be configured as a cardiovascular wireless electrostimulation node fixed to or in myocardial tissue 102. Inductive energy can be coupled to an inductive pickup 112 supported by one or more shape-memory or other mechanical struts 300A, 300B, 300C, 300D. In an example, as shown in FIG. 3B, the struts 300A, 300C, 300D can be disposed radially around the cylindrical housing 310 such as at angles of 120 degrees with respect to each other. FIG. 7 shows an example of a partial cross section view of the inductive pickup 112 comprising both a mechanical support and a separate inductive wire loop, attached to the mechanical support. In another example, the inductive pickup wire loop itself can serve as both the electrical pickup and mechanical support, reducing the complexity of the assembly. In some examples, a tissue attachment mechanism such as helical fixation device 255 can secure a cylindrical housing 310 to myocardial tissue 102. This can pull the cylindrical housing 310 to a desired depth within myocardial tissue 102 such as with an objective of leaving as little of the housing 310 protruding out of the myocardial tissue 102 as possible. This can reduce or minimize the possibility of impingement against other tissue such as during a heart contraction. The total length of the seed HOA can be selected to reduce or minimize the likelihood of penetrating the far side of the myocardium 102. In an example, assuming a nominal minimum myocardial wall thickness of 10mm, the cylindrical housing 310 can be configured to have a diameter of less than or equal to 2mm, and a length of less than or equal to 5mm, such that a total length of the cylindrical housing 310 plus the anode 260, cathode 250, and fixation device 255 is less than 10 mm, which is short enough to avoid piercing the far side of the myocardium, hi some examples, discrete internal electronic components can be included in the cylindrical housing 310. Housing 310 internal electronic components can be selected for reduced size, and can include, among other things, one or more discrete surface-mount capacitors, discrete surface-mount resistors, or discrete surface-mount diodes, and the like, hi an example, a single diode can be used as a half-wave rectifier to reduce housing 310 volume. A cathode electrode 250 can provide a first electrostimulation electrode that can be embedded into myocardial tissue 102. In certain examples, all or a portion of fixation device 255 can be conductively coupled to electrode 250 such as to target electrostimulation to a specific depth of myocardial tissue 102. An anode electrode 260 can provide a second electrostimulation electrode that can be in contact with either other cardiac tissue 102 or blood, for instance to provide a return path to complete the electrostimulation circuit. For example, in an endocardial application, the cardiovascular wireless electrostimulation node 11 OA is configured for intravascular delivery to the interior of the heart, via one or more blood vessels, such as transluminally through a lumen of a catheter, and can be embedded in myocardium 102 penetrating an endocardial wall 102A such as the left ventricular free wall. Blood in contact with anode 260 can provide a conductive path for electrostimulation energy allowing contractile electrostimulation (e.g., pacing) of the myocardium 102 coupled to cathode 250. In some examples, a retainer shaft 265 can be included, such as to allow for manipulation of the seed HOA during implantation (for instance, to secure an actuator assembly to the seed HOA as part of an intravascular delivery system). Struts 300A-D can be constructed from a spring-like (e.g., self-expanding or self-opening) flexible shape-memory material such as a NiTi (Nitinol) compound, such as to accommodate a desired insertion depth of the cylindrical housing while flexibly maintaining an approximately circular loop shape for inductive pickup 112. In some examples, struts 300A-D can be welded or adhered to an inductive pickup 112 comprising a mechanical support made of a shape-memory material such as a NiTi (Nitinol) compound. FIGS. 4A-B are similar to FIGS. 3A-B, but illustrate generally at least a portion of another example of a wireless electrostimulation node HOB that can be included in a wireless electrostimulation system. The combination of one or more struts 400 A-D or barb structures 455 A-B can provide fixation of the seed HOB in, for example, cardiac tissue 102. In these examples, rotation is not required in order to establish a specified depth of penetration in myocardium 102. Housing 410 can be pushed into tissue 102 to a desired depth, such as to avoid piercing an epicardial wall opposite penetration into the myocardium 102. In the example in FIGS. 4A-B, the housing 410 is shown as cylindrical, but the actual cross-section of the housing can also be configured as a polygon such as to inhibit or to prevent rotation within an implant delivery catheter. Implant depth can be controlled or limited such as by modifying strut structures 400A-D to provide a "J"-shaped loop or hook extending outwards from housing 410 as shown in the example of FIG. 4A. As the seed HOB further penetrates myocardium 102, eventually struts 400 A-D can limit further insertion (e.g., insertion force increases substantially as "J"-shaped loops impact heart wall 102A). Side barbs 455 A-B can be included such as to inhibit or prevent removal of seed HOB without substantial force. In this manner, specified depth can be obtained or maintained. In some examples, barbs 455 A- 455B can be configured to expand outward or retract inward, such as during implantation, such as to facilitate one or more of implantation, removal or retraction of seed HOB. A variety of different electrostimulus electrode shapes can be used, including, for example, a point-type cathode electrode 450 such as shown in FIG. 4A, and a corresponding anode electrode 460. Struts 400 A-D can be mechanically secured to inductive pickup 112B, such as by wrapping around or encircling the cross section of inductive pickup 112B, for example, such as shown in FIG. 4A. Other techniques of mechanically coupling struts 400A-D can include welding or adhering one or more of the struts 400A-D, such as to one or more of the housing 410, inductive pickup 112B, etc. Generally, a retainer shaft 465 can be provided, such as to temporarily secure the seed HOB to an actuator component of an intravascular delivery system during implant. In some examples, one or more elements of the seeds HOA and HOB shown in FIGS. 3A, 3B, 4A, 4B can be coated with an anti-coagulant or other treatment, such as to suppress clot or thrombus formation. In some examples, one or more elements of the seeds 11 OA, HOB can be finished with a surface treatment, such as to enhance tissue ingrowth. In some examples, the seed 11 OA, HOB can be incorporated into the tissue 102. Such embedding can reduce the likelihood of thrombo-embolism, and can also reduce the threshold energy that achieves desired electrostimulation (e.g., reduction of myocardial pacing threshold voltage). Examples of tissue ingrowth enhancing treatments include surface roughening or texturing, or one or more other porosity-enhancement treatments. Examples of elements that can be treated with a tissue ingrowth enhancing surface finish include the strut structure(s) 300A-D, 400A-D, the inductive pickup 112A or 112B, cylindrical housing 310 or 410, etc. In certain examples, one or more elements of the seeds HOA and HOB can include one or more materials that can be selected for radio-opacity, such as to enhance visibility of an implanted component during radiographic medical imaging. FIG. 5 is a partial cross-sectional view illustrating generally an example of at least a portion of a wireless electrostimulation system including an elongate intravascular delivery catheter 570, such as for carrying or passing a wireless electrostimulation node housing 510 through a lumen 571 formed by the catheter 570. In some examples, venous access can be achieved via the subclavian vein or femoral artery, and a guide catheter can then be inserted. For example, once a guide catheter has achieved access to an endocardial region of the heart 102 A, a delivery catheter 570, for example as shown in FIG. 5, can be passed transluminal^ through the lumen of the guide catheter. The delivery catheter 570 can be open at an end near a cardiac tissue target 102. The delivery catheter 570 can be large enough in hollow cross sectional area forming the lumen 571 to allow a cardiovascular wireless electrostimulation node housing 510, expandable inductive pickup 512 and one or more expandable struts 500A, 500B to be routed through one or more blood vessels via the catheter 571 and endocardially implanted entirely within the heart at the tissue target 102. The rotational position and position along the length of the delivery catheter 570 of the seed housing 510 can be manipulated, in an example, such as by a hollow, flexible actuator 572. The actuator 572 can be mechanically coupled to a retainer pin 565 that can be connected to the seed housing 510. A fϊngered-adaptor 574 can be used to engage the retainer pin 565 and to displace it into a corresponding recess on the fingered-adaptor 574 such as by using a locking wire 573. At the distal end of the delivery catheter, outside the body, a plunger or other similar manipulator can be used, such as to apply rotational or translational (e.g., sliding) force to actuator 572. For example, if a helical tine fixation device 555 is used, the actuator 572 can transmit rotational force to the seed housing 510 to screw the tine 555 into myocardial tissue 102, such as to achieve a desired depth during implantation of the seed housing 510. During the implant procedure, one or more struts 500A, 500B can be used to couple the inductive pickup 512 to the mechanical housing 510 of the seed. The struts 500A, 500B can be delivered in folded or compressed form, such as to reduce cross-sectional area during delivery. In an example, such as shown in FIG. 5, the struts 500A, 500B and inductive pickup 512 can be folded linearly parallel to the body of the housing 510. In another example, to further reduce the net length of the entire assembly during implant, the struts 500A, 500B and inductive pickup 512 can be wound spirally around the housing 510. Once a desired depth of fixation device 555 is achieved, locking pull-wire 573 can be pulled. For example, if attached to an independent manipulator at the distal end of the delivery catheter 570, pull-wire 573 can be removed by pulling the manipulator. Once locking pull-wire 573 has been pulled clear of retainer pin 565, the entire delivery catheter 570 and actuator rod 572 can be pulled away from cardiac tissue wall 102 A. This allows seed housing 510, and fixation 555 to remain. FIG. 6 is a partial cross-sectional view, similar to FIG. 5, but illustrating generally an example of at least a portion of a wireless electrostimulation system including the removal of a pull-wire 573, the retraction of an actuator rod 572 and fingered-adaptor 574 through the hollow region, such as a lumen 571, of a delivery catheter 570, and the retraction of the catheter 570 from a cardiac tissue wall 102 A. In this example, retainer pin 565 is no longer captive, thus seed assembly HOC remains at the cardiac tissue location 102 A, 102. In some examples, when delivery catheter 570 is pulled away from cardiac tissue wall 102 A, inductive pickup 512 can expand to an outer diameter of, for instance, 2 centimeters. The size of the inductive pickup 512 when folded, as shown in FIG. 5, can be related to the size of the inductive pickup 512 when expanded, as shown in FIG. 6. The expanded outer diameter of inductive pickup 512 can be selected to allow for intravascular delivery using delivery catheter 570. Once clear of the hollow region, such as the lumen 571, of the delivery catheter 570, shape-memory mechanical struts 500A, 500B can expand the inductive pickup 512, such as by using a self-expanding shape-memory material, hi an example, additional expansion force and shape-memory can be provided by the inductive pickup 512 itself comprising a mechanical support that can be separate from the struts 500A-B. See FIGS. 7-9 for examples of inductive pickup and inductive antenna configurations. Similar to FIGS. 3A-B, and FIGS. 4A-B, fixation device 555 can help retain the seed HOC, such as at a specified depth in myocardial tissue 102. Anode 550 and cathode 560 electrodes provide electrostimulus energy. FIG. 7 is a partial cross-sectional view illustrating generally an example of at least a portion of a wireless electrostimulation system including an inductive assembly 700. In this example, the inductive assembly 700 includes windings of a wire loop 710A, 710B and a mechanical support 705. hi this example, a local encapsulant 720 can be provided, such as for surrounding the wire loop windings 710A, 710B. A bulk encapsulant 730 can be provided, in certain examples, such as for surrounding both the mechanical support 705 and wire loop windings 710A, 710B. The cross-sectional view of the assembly 700 can describe either an inductive pickup included as a portion of a seed device (such as shown in FIG. 3A-B), or, for example, to an inductive antenna included as a portion of a wireless energy source (such as shown in FIG. 1). hi the example shown in FIG. 7, multiple windings 710A, 710B can be disposed adjacent to or near a mechanical support 705. The windings 710A, 710B can be constructed of flexible insulated wire. Individual windings 710A, 710B, can themselves be constructed of multiple strands of non-insulated wire, such as for providing enhanced flexibility. In an example, Litz wire (e.g., comprising multiple strands of silver wire) can be selected, such as for providing flexibility and improved magnetic performance, such as discussed below with respect to the example of FIG. 12. In another example, insulated silver wire can be used for one or more of the wire loops 710A, 710B. In the example shown, encapsulant 720 can serve to inhibit or prevent blood or moisture ingress into the inter-winding areas between individual wire loops 710A, 710B. The encapsulant 720 can also help adhere winding loops 710A, 710B together, such as to preserve the relative spacing and position of the winding loops 710A, 710B. Preventing moisture ingress and stabilizing the windings can help reduce variation in electrical performance, such as over time or during implant (e.g., the inductance and inter- winding capacitance of the inductive assembly can remain more stable). To facilitate expansion during implantation, the encapsulant 720 can be selected for elasticity, such as for flexibility, or for bio-compatibility, such as if no bulk encapsulant 730 is used. A material for encapsulant 720 such as medical-grade silicone can provide both elasticity and bio-compatibility. In certain examples, the bulk encapsulant 730 can serve both to protect the inductive pickup assembly 700 and to secure the inductive wire loops 710A, 710B to mechanical support 705. Examples of bulk encapsulants can include bio-compatible overmolding compound, heat-shrink tubing, silicone, or other materials that can be selected for flexibility and bio-compatibility. The outer- most exposed surface of the inductive assembly 700, in the example shown in FIG. 7 the bulk encapsulant 730, can be treated with either a substance that promotes a tissue ingrowth, or an anti-coagulation substance or both, similar to such finish or treatment such as discussed with respect to FIGS. 3A-B, 4A-B. The encapsulant can include a variety of possible over-molding or sheathing materials. The encapsulant need not result in an entirely void-free space. For example, the encapsulant can permit penetration of one or more other elements of the assembly 700. For instance, in some examples, one or more strut structures such as described in previous figures, can penetrate the encapsulant material 730, such as to achieve mechanical or other affixation to the mechanical support 705. In certain examples, such a strut structure can be mechanically or otherwise affixed to the encapsulant material 730. In certain examples, a porous or roughened outer surface can be intentionally developed on the encapsulant material 730, such as to promote tissue ingrowth. In certain examples, only a single insulated wire winding loop 710A is used without any separate support 705. FIG. 8 is a diagram illustrating generally a perspective view of an example of at least a portion of a wireless electrostimulation system including a spiral wire loop 802 wound coaxially to encircle a mechanical support 800 or "core." In this example, a non-conductive gap or discontinuity 801 is located along the mechanical support loop 800. The gap 801 can reduce a loss induced by a "shorted secondary effect" of the core 800 when a conductive material is used for the core 800. Such a loss can be due to induced eddy currents in, for example, the mechanical support loop 800. The shorted secondary effect occurs when the core 800 acts like a shorted transformer winding magnetically coupled to the wire loop 802. The electrical effect of such losses can include reduced efficiency or de-tuning of the high-Q inductive antenna/inductive pickup pair in operation. This can be referred to as "antenna pulling." Introducing gap 801 breaks up the induced current loop formed by the core 800 and can reduce loss or antenna pulling effects. FIG. 9 is a diagram, similar to FIG. 8, but illustrating generally a perspective view of an example of at least a portion of a wireless electrostimulation system including wire loop 902 wound in a spiral on a face of a mechanical support 900, and including a non-conductive gap 901, similar to that discussed above with respect to FIG. 8. The examples shown in FIGS. 8-9 demonstrate that different physical arrangements of inductive wire loops 802, 902 can be used, such as with respect to mechanical supports 800, 900. In some examples, FIGS. 8-9 can be combined with the encapsulant or surface treatments discussed in FIG. 7, such as to form a bio-compatible inductive antenna or inductive pickup assembly capable of being implanted within an endocardial location or within the coronary vasculature. FIG. 10 is a diagram, similar to FIG. 1, but illustrating generally an example of at least a portion of a wireless electrostimulation system 1000 including an external device 1040 configured for generating a time-varying magnetic flux 1014 that can be captured by one or more implantable wireless electrostimulation nodes 1005 A, 1005B at a cardiac location 102 inside a patient body 1010. For example, the external device 1040 can be a physician programmer unit comprising a therapy control unit and wireless energy transmission source. In certain examples, the external device 1040 can include a device worn externally by a patient, such as to provide ambulatory electrostimulation therapy on demand or according to a program established by the external device 1040. In certain examples, such as where acute electrostimulation therapy is desired (e.g., in conjunction with percutaneous coronary intervention or other related treatment), the external device 1040 can be incorporated into a bed, vest, hat, chair, or other apparatus that can be worn by or located near the patient, such as for the brief period during which electrostimulus therapy is desired. ("Vcalc"), predicted at a wireless electrostimulation node inductive pickup receiver. A corresponding actual measured output voltage, ("Vmeas") can be measured across the output electrodes of an inductive pickup receiver of an experimental prototype of the wireless electrostimulation node. The measured output voltage, ("Vmeas"), corresponds to the peak voltage measured on the rising edge of a electrostimulation waveform measured across the wireless electrostimulation node's electrostimulation electrodes, which are coupled to a test load. Both voltages ("Vcalc," "Vmeas") can be plotted versus the separation (e.g., in centimeters) between (1) an energy transmission source inductive antenna (transmitter) and (2) a wireless electrostimulation node inductive pickup (receiver). The materials and electrical parameters used for constructing by way of example the experimental prototype described with respect to FIG. 12 are described in TABLE 1. The calculated predicted output voltage shown in FIG. 12, ("Vcalc"), can be estimated by computing |VL| using EQUATION 2 and the electrical parameters shown in TABLE 1. FIG. 13 is an example of a plot from an efficiency analysis showing the numerically estimated power coupling efficiency, η, in percent (%), and battery lifetime (in months) associated with a given separation between (1) an example of an energy transmission source inductive antenna (transmitter) and (2) an example of a wireless electrostimulation node inductive pickup (receiver) The power coupling efficiency, η, can be computed from EQUATION 1, such as using the electrical parameters of TABLE 1. Assuming an output voltage of |VL| = 3.6 Volts at a coil separation of, for example, 8 cm, as a pacing benchmark, the output power can be computed as |VL|2 / (2RL ) = -0.013 Watts for the duration of the pacing pulse. The average power output can by computed by multiplying this value by the duty cycle. An example of a cardiac pacing pulse duration is 500 μsec, and an example of a cycle length is 850 msec (corresponding to ~70 heart beats per minute). The resulting duty cycle is 0.00059, and the average output power for a 3.6 volt pacing amplitude is around 7.5 μW. The input power can be computed by dividing the computed output power, for this example 7.5 μW, by the power coupling efficiency, η, computed from EQUATION 1, and adding the quiescent power consumed by, for example, a microprocessor or microcontroller in the transmitter. Such a quiescent power can be, in an illustrative example, 0.425 μW. Assuming a minimum 3.6 volt pacing amplitude, FIG. 12 shows power coupling efficiencies, η, in percent (%), for a range of separations between the transmitter and receiver coils assuming electrical parameters as are specified in the example in TABLE 1. Dividing a battery Watt-hour capacity by the output power usage gives an estimate of the battery lifetime. An example of a 25-gram lithium rechargeable battery includes around 12 Watt-hours of useful (recoverable) energy. FIG. 13 shows battery lifetime (in months) for various separations between transmitter and receiver coils assuming electrical parameters as specified in the example in TABLE 1 and assuming, in an illustrative example, a 12 Watt-hr charge available to an implantable transmitter battery. In the example shown in FIG. 13, battery lifetimes of around three months or longer can be feasible for receiver separations of 8 cm or less at pacing output voltages of 3.6 volts or less. Received power will diminish as the angle between the planes of the transmit and receive coils deviates from zero degrees (reducing the coupling coefficient, K), resulting in orientation sensitivity. In some examples, multiple transmit coils in multiple planes, and even multiple coils in a single plane, can help reduce such orientation sensitivity. Multiple receiver coils consume little additional energy in the far field of the transmitter, allowing for examples in which multiple receivers can operate near an inductive transmitter. In certain examples, such as discussed above, a useful range of 8 cm can be suitable for a transmitter inductive antenna that can be placed against the right ventricular (RV) septum with one or more loop receivers that can be located endocardially on the left ventricular (LV) free wall, for example, even for a dilated heart. In some examples, an inductive receiver on the apical LV free wall can be separated by 4 - 6 cm from a transmitter in the RV or an external transmitter. FIG. 14 is a diagram, similar to FIG. 1, but illustrating generally an example of at least a portion of a wireless electrostimulation system including a subcutaneous inductive antenna. In some examples, an implantable transmitter inductive antenna 1408 need not be located endocardially within a heart 102, and may be placed subcutaneously on the chest of a patient 1010, or in the pericardial space adjacent to the heart 102. An inductive antenna feedwire assembly 1406 can be electrically coupled between (1) an inductive antenna 1408 at a distal end of the feedwire assembly 1406, and (2) an implantable cardiac rhythm management device 1420 at a proximal end of the feedwire assembly 1406. In some examples, an inductive antenna 1408 generates a time-varying magnetic flux to be captured by electrostimulation electrode assemblies 1005A, 1005B. In some examples, the inductive antenna 1408 and feedwire assembly 1406 can be constructed similarly to, for example, an endocardial flexible lead system (e.g., a bio-compatible silicone outer jacket can be selected for an outer surface of the feedwire assembly 1406, and one or more coiled metallic conductors insulated from one another can be used internally to the assembly 1406 to energize an inductive antenna 1408). The above detailed description includes references to the accompanying drawings, which form a part of the detailed description. The drawings show, by way of illustration, specific embodiments in which the invention can be practiced. These embodiments are also referred to herein as "examples." Such examples can include elements in addition to those shown and described. However, the present inventors also contemplate examples in which only those elements shown and described are provided. All publications, patents, and patent documents referred to in this document are incorporated by reference herein in their entirety, as though individually incorporated by reference. In the event of inconsistent usages between this document and those documents so incorporated by reference, the usage in the incorporated reference(s) should be considered supplementary to that of this document; for irreconcilable inconsistencies, the usage in this document controls. In this document, the terms "a" or "an" are used, as is common in patent documents, to include one or more than one, independent of any other instances or usages of "a" or "one or more." In this document, the term "or" is used to refer to a nonexclusive or, such that "A or B" includes "A but not B," "B but not A," and "A and B," unless otherwise indicated. In the appended claims, the terms "including" and "in which" are used as the plain-English equivalents of the respective terms "comprising" and "wherein." Also, in the following claims, the terms "including" and "comprising" are open-ended, that is, a system, device, article, or process that includes elements in addition to those listed after such a term in a claim are still deemed to fall within the scope of that claim. Moreover, in the following claims, the terms "first," "second," and "third," etc. are used merely as labels, and are not intended to impose numerical requirements on their objects. Method examples described herein can be machine or computer- implemented at least in part. Some examples can include a computer-readable medium or machine-readable medium encoded with instructions operable to configure an electronic device to perform methods as described in the above examples. An implementation of such methods can include code, such as microcode, assembly language code, a higher-level language code, or the like. Such code can include computer readable instructions for performing various methods. The code may form portions of computer program products. Further, the code may be tangibly stored on one or more volatile or non- volatile computer-readable media during execution or at other times. These computer- readable media may include, but are not limited to, hard disks, removable magnetic disks, removable optical disks (e.g., compact disks and digital video disks), magnetic cassettes, memory cards or sticks, random access memories (RAMs), read only memories (ROMs), and the like. 1. A wireless electrostimulation system comprising: a wireless energy transmission source, including an inductive antenna, configured to generate a time-varying magnetic flux; a cardiovascular wireless electrostimulation node sized and shaped to be implantable using a percutaneous transluminal catheter delivery system, the wireless electrostimulation node comprising: a receiver circuit configured to capture at least enough inductively-coupled energy from the inductive antenna to generate a tissue electrostimulation, the receiver circuit comprising a mechanically-expandable inductive pickup configured to link the time-varying magnetic flux, the inductive pickup comprising a core material including a relative magnetic permeability less than 1.1; and a tissue electrostimulation circuit, coupled to the receiver circuit, configured to deliver energy captured by the receiver circuit as a specified tissue electrostimulation waveform, the tissue electrostimulation circuit comprising at least one tissue electrostimulation electrode; and a therapy control unit, communicatively coupled to the tissue electrostimulation node and configured to initiate a delivery of a tissue electrostimulation by the tissue electrostimulation electrode. 2. The system of claim 1, wherein the cardiovascular wireless electrostimulation node is configured and sized for intravascular delivery. 3. The system of any of claims 1 through 2, wherein the receiver circuit comprises: an energy storage device configured to store inductively-coupled energy transferred by the time- varying magnetic flux; wherein the energy storage device is configured to store at most 1 milliJoule of energy; and wherein the tissue electrostimulation is inhibited by a depletion of the energy storage device no more than 1 minute after the termination of the inductively-coupled energy transfer. 4. The system of any of claims 1 through 3, wherein the tissue electrostimulation circuit comprises: a rectifier, coupled between the receiver circuit and the tissue stimulation electrode; a direct-current blocking device, coupled between the tissue electrostimulation electrode and the receiver circuit; wherein the at least one tissue electrostimulation electrode comprises a cathode configured to be coupled to cardiac tissue; wherein the at least one tissue electrostimulation electrode comprises an anode configured to be coupled to cardiac tissue; and wherein the tissue electrostimulation circuit is configured to be capable of generating, between the anode and the cathode, an electrostimulation pulse of at least 2.5V peak amplitude at a pulse width of 0.4 msec when coupled to a 500 Ohm equivalent load. 5. The system of any of claims 1 through 4, wherein the cardiovascular wireless electrostimulation node comprises: a mechanically-expandable inductive pickup comprising: an insulated wire loop; and an expandable mechanical support comprising a loop of shape- memory material mechanically coupled to the insulated wire loop, wherein at least a portion of the loop of shape-memory material is non- conductive; a housing comprising: a receiver circuit electrical charge storage device conductively coupled to the insulated wire loop; and the tissue electrostimulation circuit; wherein the housing is disposed within a space encompassed by the loop of shape-memory material; and a strut, comprised of shape-memory material, configured to secure the loop of shape-memory material to the cylindrical housing. 6. The system of claim 5, comprising a bio-compatible dielectric encapsulant configured to encompass at least a portion of the inductive pickup. 7. The system of any of claims 5 through 6, wherein the wireless energy transmission source is configured to vary a burst pulse duration of the time- varying magnetic flux, wherein the tissue electrostimulation circuit comprises a voltage clamping device coupled to the output of the rectifier, and wherein an energy content of the electrostimulation pulse is controlled by the burst pulse duration when a voltage across the voltage clamping device is substantially equal to or greater than a voltage clamping device threshold voltage. 8. The system of any of claims 5 through 7, wherein the inductive pickup is configured for a maximum outside diameter, when expanded, of less than or equal to 2 cm; wherein the housing comprises a cylindrical diameter less than or equal to 2 mm, and a length less than or equal to 5 mm; and wherein a total length of the cylindrical housing and the cardiac tissue attachment mechanism is less than or equal to a nominal minimum myocardial tissue wall thickness of 10mm. 9. The system of any of claims 1 through 8, wherein the wireless energy transmission source is configured to generate the time-varying magnetic flux at a specified receiver resonant frequency within a range of frequencies from 500 kilohertz to 5 megahertz, inclusive; and wherein the wireless energy transmission source is configured to deliver the inductively coupled energy at a power coupling efficiency of at least 1%. 10. The system of any of claims 1 through 9, wherein the wireless energy transmission source and the therapy control unit are both configured to be located external to a patient's body containing the wireless electrostimulation node. 11. The system of any of claims 1 through 10, comprising a battery-powered implantable cardiac rhythm management unit that includes the wireless energy transmission source and the therapy control unit. 12. The system of claim 11 , wherein the wireless energy transmission source comprises: an implantable flexible lead comprising: a distal end configured to be located near the implantable wireless electrostimulation node; a proximal end configured to be located at or near a housing of the battery-powered implantable cardiac rhythm management unit; at least two antenna feed conductors disposed internally to the lead and conductively coupled to the housing of the battery- powered implantable cardiac rhythm management unit; and the inductive antenna disposed at the distal end of the lead, and conductively coupled to the at least two antenna feed conductors at the distal end of the lead; and the therapy control unit configured to energize the at least two antenna feed conductors. 13. A method, comprising: delivering a cardiovascular wireless electrostimulation node to an intra- body location; expanding a wireless electrostimulation node inductive pickup; generating a time- varying magnetic flux; linking the time-varying magnetic flux to the wireless electrostimulation node inductive pickup; configuring a wireless electrostimulation node inductive pickup wire loop with a core material of a relative magnetic permeability less than 1.1; capturing at least enough inductively-coupled energy to deliver a tissue electrostimulation; controlling the initiation of the delivery of a specified tissue electrostimulation waveform; and delivering a specified tissue electrostimulation waveform in response to an initiation. 14. The method of claim 13, comprising: delivering a cardiovascular wireless electrostimulation node through a vascular path to an intra-body location. 15. The method of claim 13, comprising: storing the inductively-coupled energy within an energy storage device included in the wireless electrostimulation node; inhibiting the storage of more than 1 milliJoule of energy within the energy storage device; terminating the time-varying magnetic flux; depleting the energy storage device; and inhibiting the delivery of the tissue electrostimulation more than 1 minute after the termination of the time-varying magnetic flux in response to the depleting the energy storage device. 16. The method of claim 13, comprising: rectifying the time- varying magnetic flux; coupling a cathode to cardiac tissue; coupling an anode to cardiac tissue; generating, between the anode and the cathode, an electrostimulation pulse of at least 2.5 V peak amplitude at a pulse width of 0.4 msec when coupled to a 500 Ohm equivalent load; and blocking the passage of direct-current between a tissue stimulation electrode and a receiver circuit. 17. The method of claim 16, comprising: insulating the inductive pickup wire loop; coupling the inductive pickup wire loop to a shape-memory mechanical support mechanically; expanding the shape-memory expandable mechanical support to a specified loop shape proximate to a cardiac tissue wall; forming a non-conductive portion along the circumference of the shape- memory expandable mechanical support; coupling the shape-memory mechanical support to a cylindrical housing mechanically; and disposing the cylindrical housing within a space encompassed by the shape-memory mechanical support. 18. The method of claim 17, comprising: encompassing at least a portion of the inductive pickup with a biocompatible dielectric encapsulant. 19. The method of claim 17, comprising: varying a burst pulse duration of the time- varying magnetic flux; clamping a voltage developed by the rectifying the time-varying magnetic flux; and controlling an energy content of the electrostimulation pulse, via the varying of the burst pulse duration of the time-varying magnetic flux, when a voltage across a voltage clamping device is substantially equal to or greater than a voltage clamping device threshold voltage. 20. The method of claim 17, comprising: expanding the inductive pickup to a maximum outside diameter, when expanded, of less than or equal to 2 cm; limiting the cylindrical housing to a diameter less than or equal to 2mm; limiting the cylindrical housing to a length less than or equal to 5mm; and limiting a total length of the cylindrical housing and a cardiac tissue attachment mechanism to less than or equal to a nominal minimum myocardial tissue wall thickness of 10mm. 21. The method of claim 13, comprising: generating the time-varying magnetic flux at a specified receiver resonant frequency within a range of frequencies from 500 kilohertz to 5 megahertz, inclusive; and transferring the inductively-coupled energy at a power coupling efficiency of at least 1%. 22. The method of claim 13, comprising: generating the time-varying magnetic flux from a location external to a patient's body; and initiating a tissue electrostimulation from a location external to the patient's body. 23. The method of claim 13, comprising: delivering a battery-powered implantable cardiac rhythm management unit to an intra-body location; conductively coupling an inductive antenna to the implantable cardiac rhythm management device; generating the time-varying magnetic flux using the inductive antenna; and initiating a tissue electrostimulation using the implantable cardiac rhythm management unit. 24. The method of claim 23, comprising: locating a distal end of an implantable flexible lead near to the implantable wireless electrostimulation node; mechanically coupling the inductive antenna to the distal end of the implantable flexible lead; locating a proximal end of the cardiovascular implantable flexible lead at or near to a housing of the battery-powered implantable cardiac rhythm management unit therapy control unit; locating at least two antenna feed conductors within the implantable flexible lead; conductively coupling the at least two antenna feed conductors from the battery-powered implantable cardiac rhythm management unit therapy control unit housing to the inductive antenna; and energizing the at least two antenna feed conductors. FR2691905B1 (en) 1992-06-03 1998-10-16 Jacques Brehier extractable cardiac probe and process for its implementation óoeuvre.